Participating in an indexing project usually takes weeks or months of work. As I photograph and research gravestones, this is my contribution to an indexing project. Other indexing projects include transcribing records from books, from the census, or from genealogies mostly to help others find accurate information. 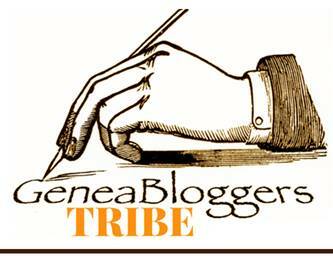 Today, most indexing projects are designed either for publication in print, for the Web or both. As part of my Stanton family research, I began working on learning how the Davis family blended into the Stanton family. At a recent family reunion, I visited, briefly, a small cemetery on the farmland of the Davis family. Time only permitted me to take a few gravestone shots but it was enough to question the entries in Grace Denison Wheeler's book, "Old Homes Of Stonington". After looking over the names on just a few stones, I discovered that some of the surnames were listed in the Bradford and Dickens Yard (p. 321-322) and some were listed in The Davis Yard (p. 300-301). I immediately asked my cousin Fred Burdick for some help and he's promised to look into it. 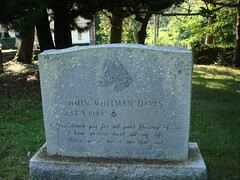 The gravestone shown here in this blog entry is one of John "Whit" Davis who is still living. He describes himself as "the last old Yankee farmer". He's quite the character. I am reading a book called The Davis Homestead written by his father. It is about life on the farm in the area of Stonington, CT. Whit and I are 7th cousins, 1 times removed as a Stanton in my line married into this Davis family. Books like this, although historical and not genealogical in nature, can give you great clues as to the life and times of any ancestor you had in the area. My family in Westerly, RI is only a few miles away from this farm and Mr. Davis (Whit's dad) sold milk to the people living in Watch Hill. He even talks about the "Great Hurricane of 1938". Watch Hill and the hurricane are always on my mind especially in the summer.